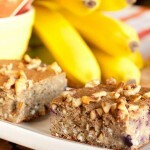 Lightly sweetened cake with blueberries, banana, and a walnut topping. Preheat your oven to 375F and line 8×8 pan with parchment paper across both sides for easy lifting and set aside. In a large bowl combine flours, whole buckwheat, chia, hemp, cinnamon, baking powder, and nutmeg. Set aside. 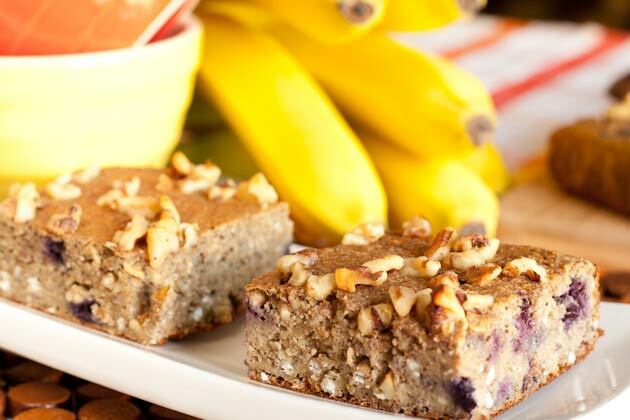 In a separate bowl, whisk milk, eggs, mashed banana, sugar, ground flax, and vanilla. Once incorporated, pour into dry ingredients. Stir until combined before adding in blueberries. Pour mixture into prepared pan and even out with a fork. Sprinkle walnuts over top. Bake for 45-50min until a toothpick inserted comes out clean. [Mine took 50 minutes].